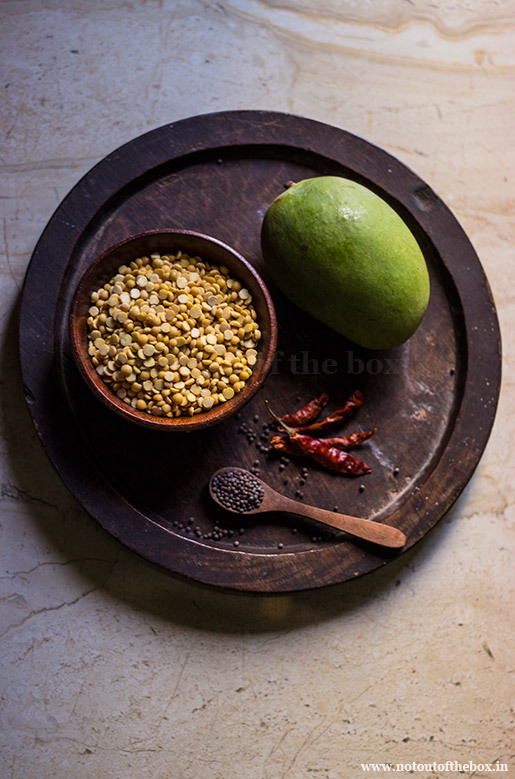 There is an old saying between Bengalis that having ‘Tok Dal’ in summer helps to keep your body cool. I don’t know it’s true or not. 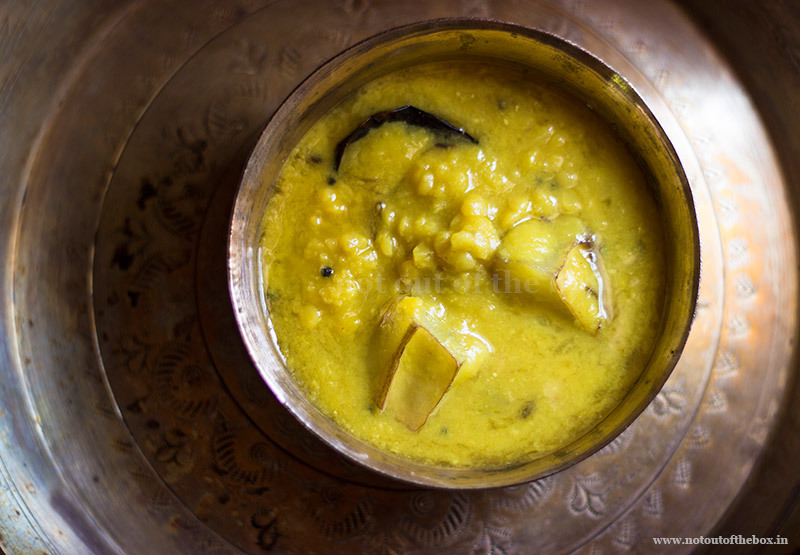 I like raw mangoes in any form, so I love this dal. Ma used to make Tok Dal with Motor dal and Masoor dal back home. I like the Motor dal version more. ‘Yellow split Peas’ has its own unique taste. Making this dal is very easy; it requires very basic cooking followed by simple tempering. At the end, satisfaction guaranteed while you’ll have this with steamed rice. Wash the dal well 3-4 times under running water, drain and keep aside. Pressure cook with enough water (water level should be 1″ high from dal), 1/2 tsp salt, green chilies and ½ tsp of mustard oil. Check after 3-4 whistles. You need to cook the dal with the grains visible and mushy at the same time. Open the lid after the pressure has reduced. Peel the raw mango, cut it into cubes. 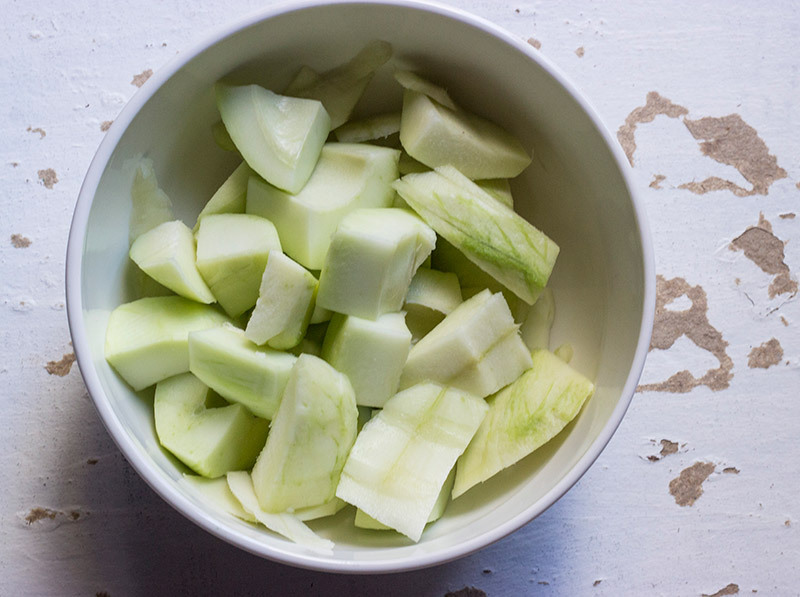 Boil the mango pieces with 1 cup of water and ¼ tsp of salt. You can boil the mangoes with dal too. But pressure cooking the raw mango pieces is not recommended, because they can be overcooked. And no traces of Mangoes can be found in that case. After boiling the mangoes I discard the water, I get very sour raw mangoes here in North India, so the discarded water helps to reduce the sourness. Keep the boiled raw mango pieces aside. Heat 1 tsp oil in a kadai/deep frying pan. Temper with fennel seeds, black mustard seeds and dry red chilli. Add the boiled dal, turmeric powder, salt and boiled raw mango pieces. Add water according to your desire for thicker or thinner dal. Mix well. Give this a good boil on medium high flame for 4-5 minutes. Remove from heat. This dal can be made with red masoor dal too.